The soil will be processed 30-40 cm deep in the field where the grass will be planted. Weak organic soils (animal stew or compost) are added to the weak soil and mixed well in the top layer. Soil quality is increased. Heavy clay soil with a thickness of 5 cm 70% sand and 30% organic material mixture is supplemented. The topsheet is thoroughly mixed. Thus, it is ensured that the soil is soft. The stuffed animal must be burnt. Thus removing the weed seeds. After the fine leveling of the soil, the ground cylinder to which the grass seeds will be added is drawn. This is very important for grass planting. How is the grass seed planted? 15 15 15 or 20-20 soil fertilizer is thrown so that the soil will be 25 gr per m2. It is a correct application of germination of grass seeds. How much is the seed of grass planted per decare? Grass seeds are 50-60 gr in meter square and 50-60 kg in decanter. The seeds are scattered longitudinally and longitudinally so that the grass seeds are balanced. How much does the reed grass seed go? It is necessary to avoid grass cultivation too often. When is the grass planting done? Grass planting is done in spring and autumn. Especially april, May, September is planted in October. The depth of grass cultivation is 1.5-2 cm. Grass seeds scattered area is pulled roller and pulled tightly. Morning and evening watering is done in the form of rain. Grass seeds begin to germinate slowly after 1 week. For 3 weeks, the grass field is irrigated regularly and the land is green. Thus, a healthy germination is achieved. There is a struggle against the ants in the grass sowing. Grass seed germination time lasts for a few weeks, depending on the type, variety and characteristics of grass seeds, after seeding application. How many days after the grass seeds are planted? The seeds of the grass seeds can be planted at the time of harvesting. In a detached house, there is a concentration in the planting of the spring grass. How should grass care be? Before and after the first form of grass grass is absolutely drawn to the roller and the blades of the grass mower to be used must be sharp first. In the first form, when the grass reaches 8 cm in height, it should be lowered to 6 cm. In the following forms, the grass height should be shortened from 5-6 cm to 3-4 cm. In every form, 1/3 of the leaf height should be trimmed. The shape direction in every way must be changed absolutely. Grass care is done according to the month. The most intensive care of the grass is done in spring and autumn. How is the grass watering done? Grass watering is done in the morning and evening in cooler hours of the day in the form of little and frequent irrigation. In hot weather, in windy weather and at night no watering is done. Night watering leads to fungal disease in the grass. Irrigation fisk is applied in the form of rainfall. Instead of very dense irrigation, less frequent irrigation is preferred. In small, grass-planted gardens irrigation is carried out with a fountain attached to the hose tip. Larger areas are irrigated by automatic irrigation systems. 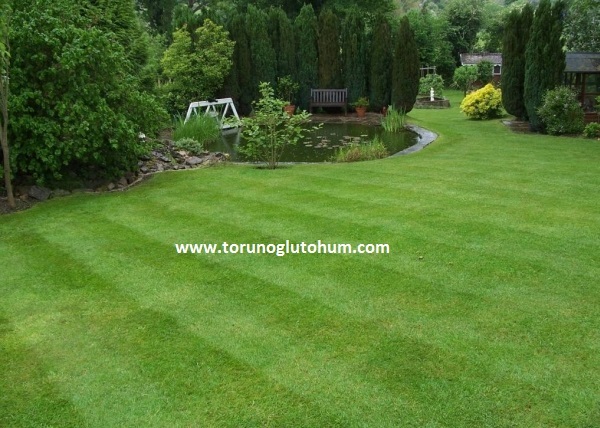 How is grass fertilization applied? Weed struggle in grass: Weed control in grass is made against broad-leaved weeds. 2-4 D. Amine-containing weed medicines are used. Medication is done in windless weather and the field should not be watered for at least one day. How to make a grass patch? Grass patches are planted in damaged grass areas to repair grass. Grass seeds are lightly raked, 1-2 cm of soil sprinkled on top of the garden rollers, and it is watered in the morning and evening. Damaged grass areas are intercropped. Grass seed moths Latin names: Lolium perenne, bermuda grass, dichondra repens, poa pratensis, festuca arundinacea, festuca ovina, festuca rubra rubra, agrostis tenius, festuca rubra trichopylla, festuca rubra comutata, trifolium repens. You can look at the pages about the seed varieties and their properties. Tags: grass sowing, grass care, how to sow grass seeds, how to care grass?